A protein-rich alternative to meat made from soyabeans. Tahoe the Indonesian name, tofu is the Chinese name. Because the preparation of bean curd resembles the process of making cheese, bean curd is also called ‘soya cheese’. The soyabeans are thoroughly washed, grown and heated to boiling point. Then this mixture is finely ground and sieved. A rennet is added to the thus obtained soya milk. This is not an animal rennet. Tahoe is neutral in taste. Using salt, spices, tamari, shoyu, sambal, sweet soya sauce or tomato puree, you can season tahoe. It is nice to put tahoe in a marinade for several hours. Tahoe beans can also be used in soup and ragout. Once removed from the packaging, it is best to store tahoe under water in a sealed container in the refrigerator and use it within 2-3 days. 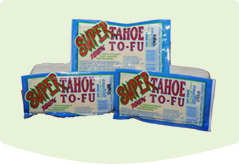 Tahoe is an excellent source of high quality protein and contains some B vitamins. When calcium sulphate is used as a coagulant, the bean curd is also a rich source of calcium. Like all other full soya products, tahoe also contains isoflavones. China – The history of tahoe started in China. Tahoe is very popular today in the East but tahoe was first made in China, more than 2000 years ago. The oldest evidence of tofu production is a Chinese illustration chiseled in a stone. It shows a kitchen scene that depicts the preparation of soya milk and bean curd in the period 25-220. The oldest written reference to tahoe also appeared in China in a poem “Ode to Tofu” by Su Ping, about 1500. History of bean curd in the Western world – In 1603 the Spanish dictionary “Vocabulario da lingoa de Iapam” was the first European document with reference to the word “tofu”. Domingo Fernandez de Navarrete described how tahoe was made in his book “A Collection of Voyages and Travels”. The first English reference to tahoe was in 1704, when the book of Navarrete was published in English.